We are Thomas and Christina. We very much like walking in Stockholm. In this website we want to encourage tourists and people who live in Stockholm to take lovely walks in one of the world's most beautiful cities. Walk in Stockholm with our app! Get to know Stockholm with our app Walk in Stockholm. 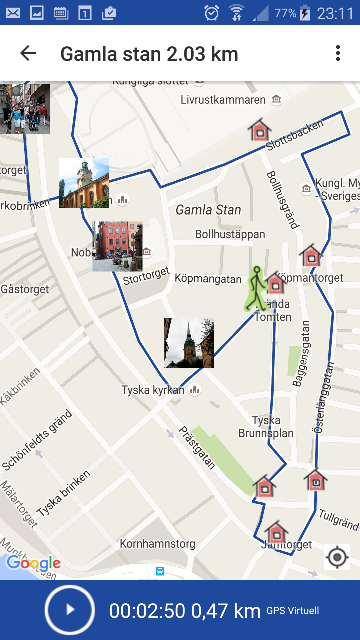 Explore Stockholm by Virtual walks or Walks In Real Life. Maps, photos and texts. With our app you can take virual walks in Stockholm, which means that you can walk wherever you are and at the same time explore and get to know Stockholm better. If you visit Stockholm you can use the app as an excellent guide at place. Welcome to watch our new 2 minutes long film with views from the Old town in Stockholm. Walk in Norrmälarstrand in Stockholm! Walk in Djurgården in Stockholm!